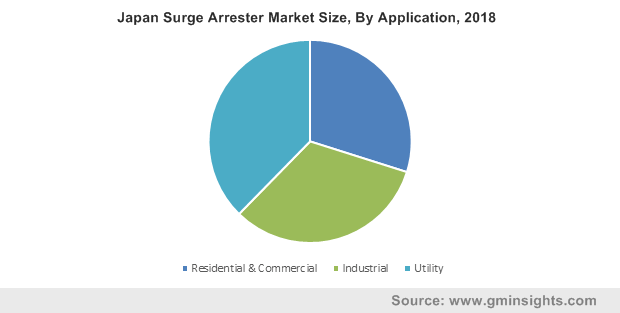 Surge Arrester Market size was valued over USD 1.35 billion in 2018 and is set to exceed an annual installation of 11 million units by 2025. Rising government measures to mitigate power supply issues along with increasing investment toward the modernization of grid infrastructure will boost the market size. In 2016, the Department of Energy (D.O.E) invested around USD 220 million for the Grid Modernization Laboratory Consortium (GMLC) that strives to streamline collaborative efforts with national labs to modernize nation’s grid. Moreover, rapid industrialization across developing nations along with expanding power generation capacities will complement the industry landscape. Increasing demand for continuous & reliable power supply coupled with strong focus of utilities for efficient electricity transmission & distribution will propel the global market. For instance, in 2017, spending toward the U.S. electricity distribution systems has grown 54% over the past two decades annually from USD 31 billion to USD 51 billion. In addition, growing emphasis toward renewable energy as a source of electricity generation necessitates the expansion of transmission networks, thereby driving the industry growth. 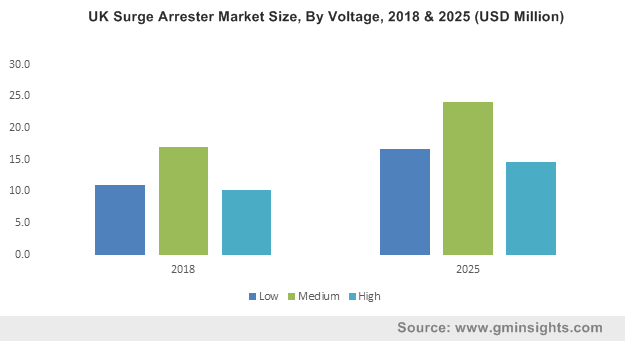 Low voltage surge arresters market will witness substantial growth on account of increasing electrification of rural areas across the developing economies along with rapid expansion of the residential establishments. LV systems finds their applicability in consumer-in-house supplies, distribution transformers, low voltage overhead lines, and other systems. Increasing distribution capacity plans to meet the growing electricity demand from rapidly expanding residential & commercial establishments will positively influence the business outlook. Rapid industrialization on account economic diversification coupled with the rising need to deploy heavy equipment protection systems from uncertain voltage surges will fuel the medium voltage surge arrester industry growth. Unprecedented growth in the demand for transformers and switchgears on account of replacement and upgradation of aging systems will further complement the industry landscape. Distribution class surge arrester market is anticipated to grow over 7% by 2025. Rising need to modify aging distribution networks along with greater reliability requirements necessitates the development of distribution systems which provide superior overvoltage protection, thereby stimulating the systems demand. Moreover, increasing need for flexible distribution grids that offer enhanced protection with lowest let thru energy and negligible internal watt loss will positively impact the business growth. High pressure relief capability, high durability, superior performance to resist contamination and excellent cantilever strength are some of the prominent features driving the station class surge arrester market size. High suitability across industrial substations and large electric utilities along with the ability to offer reliable protection to substation equipment, multiple lines & cable circuits will further propel the industry outlook. 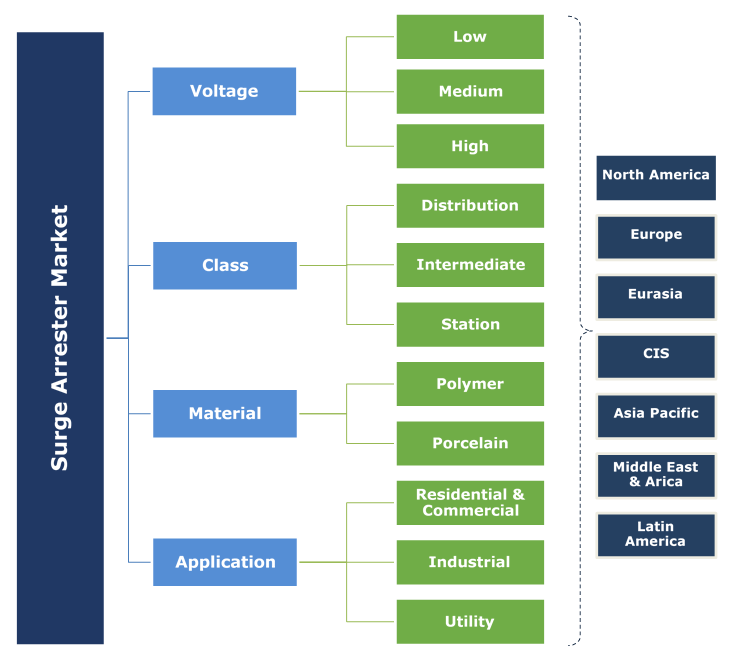 Polymer surge arresters market is anticipated to grow on account of its extensive suitability across distinct voltage ranges. Easy handling & installation, reliable performance in harsh environments, low manufacturing & operational cost, superior breaking resistance under overload conditions when compared to its counterpart will stimulate the product demand. Furthermore, burgeoning demand from various industries to efficiently combat the system faults along with considerable investments to reinforce the existing electricity infrastructure will substantially improve the business scenario. Porcelain surge arrester will witness significant growth on account of their ability to be self-supporting and resist environmental aging. Capability to perform stable operations, low raw material cost along with good mechanical strength will propel the product’s demand. Ongoing advancements in the existing product technology by various industry giants to enhance their penetration in high voltages coupled with the technical maturity of the material will enhance their adoption. 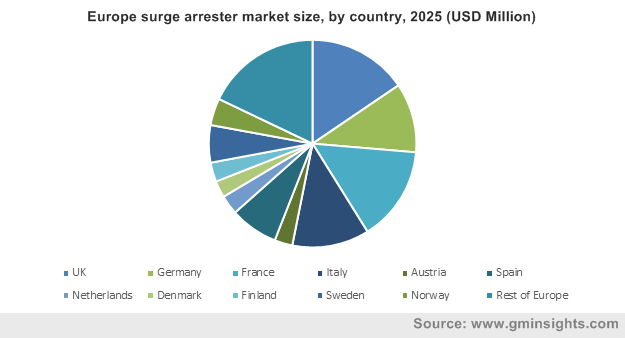 Industrial surge arrester market was valued over USD 400 million in 2018. Increasing focus toward mitigating power quality issues across the industrialized economies owing to widely prevalent problems of voltage spikes & surges will significantly enhance the adoption of these units. In addition, increasing share of electricity in the overall industrial energy consumption on account of economic growth & development will fuel the systems penetration. For instance, as per the EIA, the world industrial sector accounted for around 31.9 quadrillion Btu of electricity consumption in 2012 that will increase to nearly 37.2 quadrillion Btu by 2020. Increasing government efforts toward electrification to boost electricity access in rural areas coupled with growing emphasis of commercial facilities operating in harsh weather conditions with high lightning strikes will fuel the residential & commercial surge arrester industry growth. The Europe market is anticipated to expand over 6% by 2025 Accelerating investments toward the modernization of smart grid infrastructure driven by stringent EU regulations pertaining to grid deployment will drive the industry growth. For instance, Western Europe has plans to invest USD 133.7 billion in smart grid infrastructure over the period of 2017-27. The U.S. market in 2018 was valued over USD 150 million. Increasing investments by utilities toward capital additions along with growing security compliance standards will boost the industry outlook. Key industry players in the surge arrester market includes ABB, General Electric, Siemens, Eaton, Schneider Electric, CG Power, Elpro, DEHN and Legrand amongst others. Surge arresters are devices used for the protection of electric equipment and power system installations against lightning surges and internal switching events. These systems directly divert the over voltages to the insulation or ground to protect the equipment from damage. They improve the lightning flashover rate and protects power systems of voltages more than 1 kV (1000V).